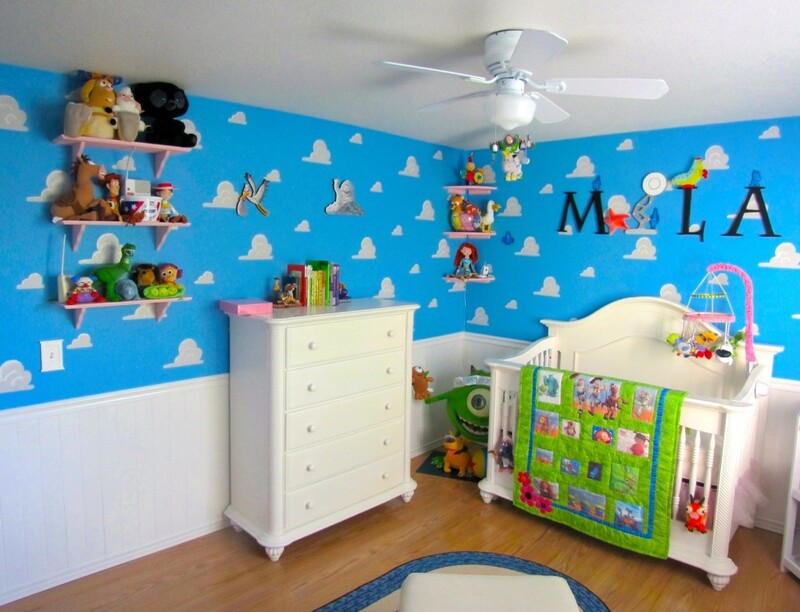 Pixar themed nursery. Anything Pixar related; Movies and shorts. On the surface or at first glance, the room screams Toy Story, but we really tried to touch on anything related to Pixar. While the bulk of it is Toy Story, if you look closely enough you will see a touch of every movie and some cartoon shorts. This was a total DIY project. The laminate flooring and the beadboard were purchased at Home Depot and we installed everything. All of the paint is from Sherwin Williams. Tie: The birds on the telephone wire and Jack-Jack on the ceiling. Patience & Time. We did everything after watching DIY videos and what we learned is that DIY videos make everthing seem easier than they actually are. Everything ended up being easy, but not until after a few trial and errors and bumps in the road. Awwwwww I super love this room! I am a big Pixar movies fan too! At first I thought the room looks so busy and there’s too much going on, but the more I noticed the details, the more I fell in love with it! Wonderful! I love the softies from UP, Russel most especially. 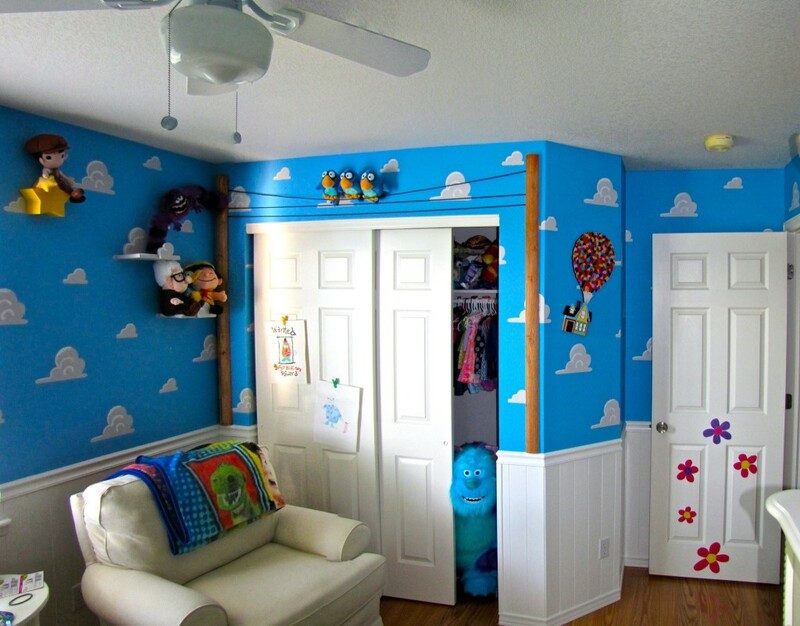 I love how you placed Monster’s Sully behind the closet door. I love those three birds perched on the wires. Where did you get the character pictures for the quilt? Did you have them made? A friend of mine used images she found on the internet. We used claws from a toy called, “Toy Story Mega Action Claw Grab.” They are connected to a red handle. We just dismantled the toy so we could have just the claws. hey where did you get all the pixar short charaxters from?? Sorry, forgot there were two halves of a question here. Regarding the birds, we found a fencing post at Home Depot and cut the curved sides down to about a quater inch thickness and nailed them to the wall. The phone lines are actually window splines, similar to what holds the netting to a frame on the screens. The birds are just pinned to the wall to look like they standing on the lines. Where did you find the blue rug? Where did you find the Pixar toy story ball?? I am so inlove!! Jasmine, the ball was a lucky find at our local Disney store. Maureen, My wife found it on the internet. Hi! I love that blanket! Where did you buy it? This is an amazing idea! what shade of blue did you use? Kassy, the quilt was stitched together by a friend of mine. Hi – what color blue is that? I also really want to know what color of blue that is!!! How many inches are the spaces between the clouds?